To make your video more engaging and eye-catching, you can add animated effects to the text messages you put on your video. Once you've added text to your video, head over to the instruments panel and look for the drop-down menu "Text Effect". There are 23 text animation effects available in Wave.video. You can also remove the text effect by choosing the option "None" in the drop-down menu. 4. Slide with border. 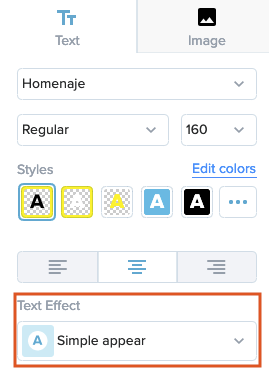 You can set the color of the border in the inspector panel. NB: if you have two and more lines of text in your video, some effects (Slide with border, Glossy entrance, Slide from stripes, Frame, Top stripe, and Stomp) become unavailable when you ungroup the text lines.